Rustemsoft proposes Skater .NET Obfuscator, an obfuscation tool for .NET code protection. It implements all known software protection techniques and obfuscation algorithms. 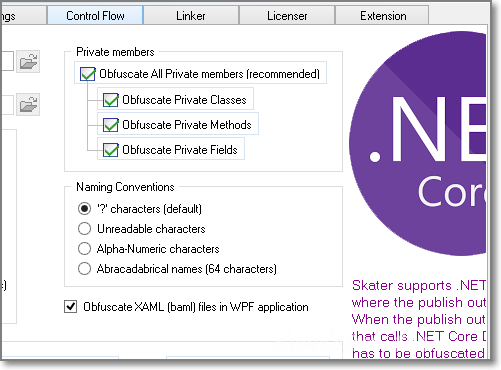 If you would like periodically obfuscate your .NET products the Skater .NET Obfuscator is for you. Rustemsoft is using the Skater for internal needs securing all Rustemsoft .NET executables and assemblies. Its command-line version running in batch mode is much useful for your scheduled products updates. You have to assign settings for an assembly in GUI version first. Then the batch obfuscate task will use the settings.